Gavil reflects on a sleeping Glavil, on how soon he will become useless with the presence of Anima Spirita, when he is called by Lord Geppernich. 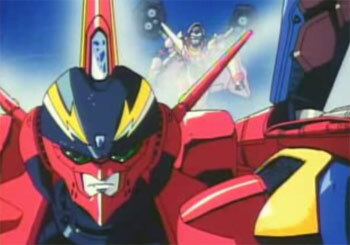 Geppernich introduces to Gavil an army of brainwashed Macross 5 soldiers for him to use. These soldiers were captured on the planet Lux when Macross 5 descended to colonize it. Mylene is seen knocking on Basara's apartment door but ends up frustrated because he's not there. Upon seeing her mother's bodyguard, Michael, on her car's mirror (obviously tailing her), she calls him over. She asks him if he could tail Basara instead of her to find out why he's been acting so strange recently. Michael speculates that its because he's seeing a woman and its most likely Rex, their acquaintance who heads a biker gang. A visibly jealous Mylene is seen playing her guitar roughly in her room and frightening Guvava while she's at it. She receives a call from Michael who says that he's seen Basara and are following him together with some men in her mother's security detail. They then proceed to lose him in an alley (same way as Mylene losing Basara in an alley in Episode 29). Michael gets an earful from Mylene for losing Basara. Basara is seen with his Sound Booster vest on playing to the comatosed Sivil in the forest. Mylene visits Gamlin on Battle 7 to talk about Basara's strange behaviour recently. While discussing Basara, Gamlin tells Mylene that he is impressed with Basara's flying ability saying that it could even be better than her father and mother's piloting skills. Both of whom are Ace pilots. He illustrates Basara's concentration skill by saying that he is able to perform a very difficult flying maneuver called QM-69 while in the midst of singing. This is a maneuver that Gamlin says even he cannot perform. When asked by Mylene whether he hated Basara, an embarrassed Gamlin says that he thought Basara's singing in the Battlefield was initially a distraction. Their discussion was cut abruptly when an attack alarm goes off. Sound Force, Emerald force and Diamond Force fly off to meet them. Gavil arrives with a new fleet of fighters. I guess with Gigil, who usually led the attacks on Macross 7, being sidelined by wanting to watch over the sleeping Sivil. The story writers had no choice but to introduce Gavil to take over Gigil's job. The protodevlin this time just use the conventional weapons of their captured enemy on which the Sound Force sound energy has no effect on. Ray Lovelock's Valkyrie is hit and he is forced to exit the battle. When an enemy fighter crashes and ejects its pilot, his rescue beacon activates which informs Macross 7 that they are indeed fighting brainwashed pilots from Macross 5. Faced with the dilemma of fighting their own people, Gamlin asks Mayor Miria for instructions on what to do. Miria says that they have no choice but to fight them, Gamlin answers that he will try to just disable them instead. This gets him into an argument with Emerald Force's leader, Docker, who tells his men to just shoot down the enemy. Gamlin reasons that they are brainwashed and it is of no fault of their own. Docker reasons that if they don't kill them they could destroy Macross 7. Just when Gamlin is about to be shot down, sound energy from Basara hits the enemy vessel releasing the pilot from the mind control. Max tells the brainwashed pilot that he'll explain later but he should leave the battlefield immediately. Upon this discovery, Dr. Chiba then tells Basara to target the enemy planes with his sound energy to release the pilots from their mind control. When all the brainwashed pilots lose their mind control, Gavil proceeds to attack Basara since he is a hindrance to Geppernich's plans. Gamlin flies in to defend Basara and while dodging Gavil's hail of rockets is able to execute a QM-69 manuever. Gavil retreats after being hit by Gamlin. Basara goes to where Ray and Veffidas landed and is joined by Gamlin and Mylene. Before Mylene joins them Gamlin tells Basara that Mylene has been worried that he's been going off lately. Basara says he doesn't know what he's talking about then complements Gamlin on his improving piloting skills. Gamlin then says that he will try to listen more to Basara's songs. Basara wonders why he's not listening to his songs considering that they are also Mylene's songs. Mylene arrives after landing her Valkyrie and wonders why Basara is singing to Gamlin.